Algarve Travel Guide - Portugal's Algarve Uncovered! Uncover Algarve travel with our guide to Faro Airport, travel by train, bus and taxi, hiring a car and helpful driving information! Whether you are travelling to the Algarve, Portugal, by flying into Faro Airport or travelling around the region by car, bus, train or taxi, get everything you need to know about Algarve travel here! For travelling to the south coast of Portugal, the Algarve has its own international airport in Faro, which has regular flights from low cost, no-frills airlines as well as scheduled flights from airports all over the UK. During the quieter winter months there are normally some really cheap Faro flights to be found, making the Algarve a tempting option even for a weekend break for some winter sun! Algarve trains are an excellent way to travel cheaply to see the sights and go to different resorts. The Portuguese rail service (CP - Comboios de Portugal, Tel: 289 803 090) is reliable, efficient and the trains are very clean. There are stations for all the main towns between Lagos and Vila Real de Santo António but some of the stations are some distance from the actual town and you will need a taxi or bus to the town itself. Algarve buses are punctual and inexpensive and you’ll find several bus stops around any resort, with a main bus terminus to enable you to go further afield when you want to. Eva Transports is the main bus company in the Algarve and you can look at times of services on their website Eva Bus (Tel: +351 289 899 700). 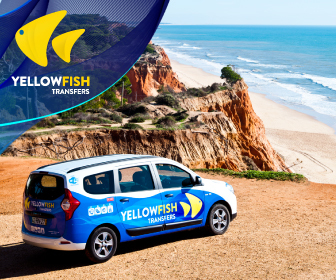 Taxis in the Algarve are very reasonably priced, especially if you are just using them to travel around your resort and if you prefer a more direct mode of transport, or are travelling with small children and lots of bags, you may decide a taxi is an easier way to travel. Algarve taxis are beige or black and green. Most of the drivers will speak some English and some will be fluent. The fare lists should be displayed inside the taxi or at the taxi rank, but it’s wise just to check the price with the driver first. If you are travelling at night-time you will incur supplementary charges (an increase of 20%) between 22:00 and 06:00, and at weekends. Hiring a car in the Algarve gives you flexibility for exploring and may be essential if your accommodation is in a quieter area and there are plenty of car hire companies to choose from. They will either arrange for you to collect your car at the airport itself or will take you to the collection point by bus. If transfer to your resort is included in your holiday arrangements you can always hire a car for a few days and collect it locally. You will need to show your passport and driving licence and either leave an imprint of your credit card as a deposit or pay cash, which will be refunded on return of the vehicle. Most hire companies include full comprehensive insurance in the price, but what is not normally included is SCDW (super collision damage waiver) - this protects you against paying the excess in event of any damage to the car (tyres and windows are not covered even by SCDW). On a normal small family car the excess can be anything from 600 to 1000 euros and the premium payable to protect it costs, on average, around 7 euros a day. The minimum age for hiring a car is 21. Driving In the Algarve is relatively straightforward and standards of driving have improved over the last few years! As with the rest of Europe, cars drive on the right. Seat belts must be worn at all times by all passengers. While you are driving you must always carry with you: your passport (or identity card), driving licence and insurance certificate and your hire car information. It is illegal to use your mobile phone whilst driving, with the exception of using hands-free equipment. If you are riding a motorcycle, helmets must be worn at all times. As with any country, there are legal limits about drinking when driving and just be warned, in Portugal the maximum level of alcohol permitted in the bloodstream is very low, just 0.5 grams/litre. In the event of a breakdown or accident you must put on the fluorescent jacket provided in the vehicle and place the warning triangle at least 30m behind the car to warn approaching traffic. Children under 12 years old or less than 150cm must travel in the back seat. The Algarve has excellent road networks and the A22 motorway (which runs from the Spanish border to Lagos) has made the whole of the Algarve easily accessible and has cut transfer times substantially. On leaving the airport car park turn right, then go round the right hand bend onto the main airport road, signed A22 (blue motorway sign). Follow the dual carriageway signed A22 Portimão, passing the car hire return garages on your left. As you approach a flyover passing car hire garages on your left, exit to the right signed Lisboa / Portimão / Loulé, (blue motorway sign) joining the N125. You will see a sign indicating Portimão 57 Km. Follow this road through three sets of Traffic Lights. Follow the Motorway sign on the link road for 3 ½ Km then turn onto the A22 signed, 'Espanha', for all resorts to the east of Faro, or take the turning immediately after to Lisboa / Albufeira / Portimão / Lagos (junction 4) for all resorts to the west of Faro. You will often see 2 orange flashing traffic lights when driving around the Algarve - these are just a warning that you are approaching a set of traffic lights. If, however, you are approaching a town or village which has a speed limit and you see a sign "velocidade controlada" and orange flashing lights, there will be a traffic light within a short distance which turns red if the approaching traffic is going too fast and you must stop. Zebra crossings are frequently situated on the approaches to roundabouts and junctions and the locals tend to step straight out without waiting or checking for traffic! Take care! Solid white lines are not to be crossed! On the spot fines can make it an expensive mistake! On the A22 there are solid lines to stop traffic changing lanes at all junctions and on many of the busier roads in towns there are solid central lines (outside supermarkets in particular). There will then be a roundabout just a short distance along the road so that you can come back on the right side. At unmarked junctions, priority is to the traffic coming from the right - even if it seems like the minor road at times!